By 2050, the world’s population is expected to reach 9.8 billion. With limited land, and intensive farming already causing irreversible environmental damage, how can we feed the world without exhausting its natural resources? All over Vietnam it’s transplanting season. In every direction farmers with their famous conical hats are pushing tiny rice seedlings deep into the mud. 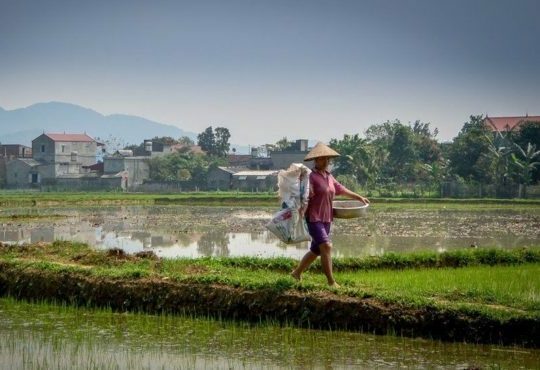 Rice farming is essential for Vietnam’s food supply and economy, but such a booming industry comes with an environmental cost. Farmers are dependent on nitrogen-based fertilizers to boost yields. But excess nitrogen can wash away, polluting rivers and oceans, as well as evaporating into the atmosphere. Travelling two hours southeast of the country’s vibrant capital Hanoi, I arrive in the Tien Hai. This modest farming town is host to an international research trial, investigating whether a strain of nitrogen-fixing bacteria can help to reduce the amount of fertilizer used by farmers. Leading the field trial is Dr. Pham Thi Thu Huong, from the Field Crop Research Institute. Rice, like other crops, relies on getting its essential nutrients from nitrogen fertilizer, but over 50% of the fertilizer used either evaporates or washes away, explains Dr Huong. It forms nitrous oxide which is 300 times more harmful than carbon dioxide as a greenhouse gas. For Dr Huong, transplanting the 15 day old rice seedlings from the lab out into the field is her first chance to examine the difference in length and weight between the treated and untreated seedlings. As seeds, the treated plants are coated in nitrogen-fixing bacteria. Normally found in sugarcane, these bacteria enable the rice plants to extract nitrogen directly from the air, instead of being reliant on artificial fertilizer. As the plant grows, an aerobic relationship between the bacteria and the rice plant develops says Dr. Huong. This allows the bacteria to take nitrogen straight from the atmosphere in a form the plant can use. The ‘Green Revolution’ of the 1960s prompted worldwide use of nitrogen-based fertilizers and pesticides. The boost in global food production saved millions of lives from the imminent threat of famine. However, the excessive use of fertilizers has continued to be so inefficient, more nitrogen is pouring off into the waterways and oceans than ever before. Excess nitrogen causes dead zones by unleashing algal blooms, which then rot and consume all available oxygen, suffocating other marine life. Today there are more than 500 dead zones in the world’s oceans, a figure that has quadrupled in the last 50 years. Read full original article at BBC.com.